As promised, here's a short video from a very cool encounter! These two whale sharks were feeding on baitfish (the greenish cloud) at Mafia Island in Tanzania. The baitfish thought they could escape from the tuna and seabirds by staying close to the sharks. And, to their credit, the sharks were happy to hide the fish... ... in their stomachs. Nom. 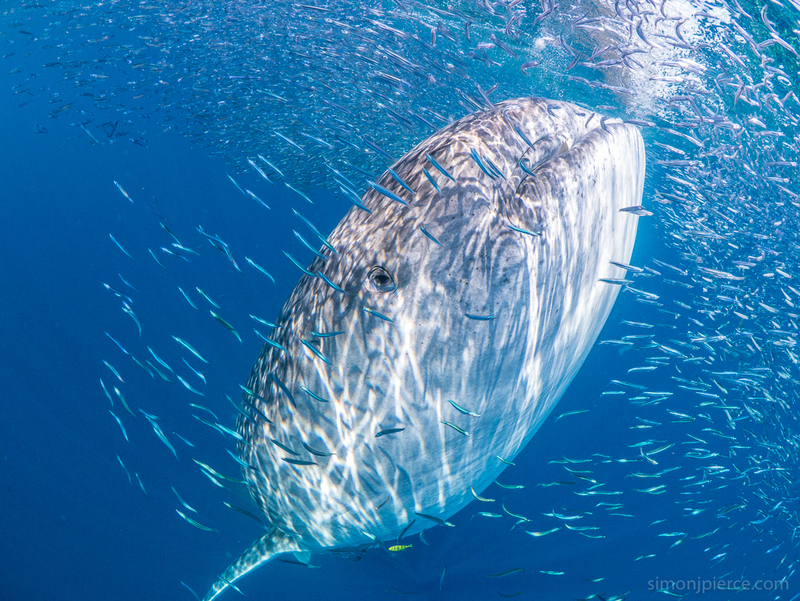 These two whale sharks (Rhincodon typus) were filmed indulging in a baitfish ball in the waters off Tanzania's Mafia Island by marine biologist Dr Simon Pierce. The giants are filter feeders and plankton connoisseurs, but they will happily feast on fish when it's available. "The baitfish thought they could escape from the tuna and seabirds by staying close to the sharks. And, to their credit, the sharks were happy to hide the fish ... in their stomachs," says Pierce. While it might look like the sharks are feeding side by side in happy harmony, Pierce is quick to point out that this is not the cooperative venture it appears to be. 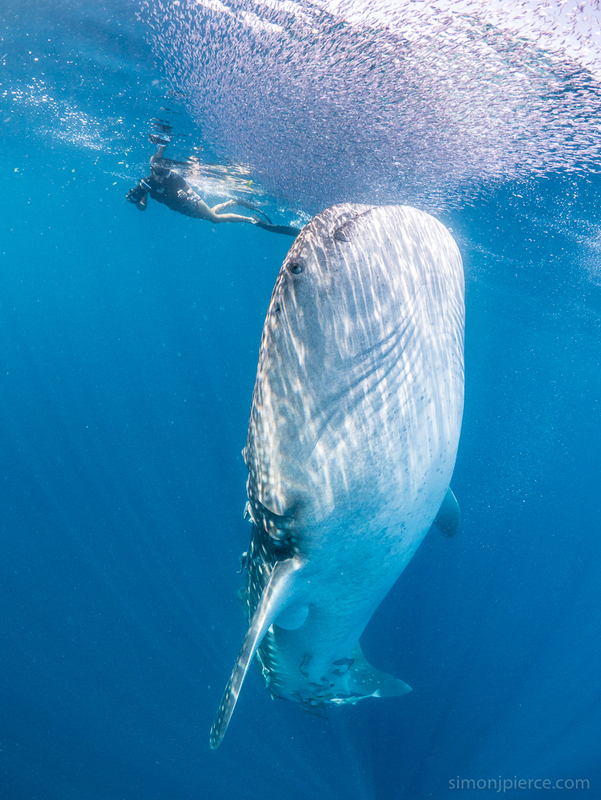 "Unfortunately, whale sharks don't really like sharing," he explains. To set the story straight, he uploaded a second clip in which the ocean giants shove each other for a place at the feast. During the encounter, PhD student Clare Prebble (who was photographing the sharks for later identification) found herself a bit too close for comfort – but fear not. Despite having one of the widest mouths in the animal kingdom, a whale shark's throat is roughly the size of a grapefruit. They couldn't swallow a human even if they wanted to. "Whale sharks have gigantic mouths – up to about 2 metres wide – but they do pay attention to what they're eating," says Pierce. "If a person is getting too close, they'll just move away, or close their mouths." Should that plan fail, the mammoth fish have a few other defences against intruders. "They routinely spit out unwanted invaders, like jellyfish, and as an absolute worse-case-scenario-slash-party-trick, most sharks can completely evert their stomachs," he says. 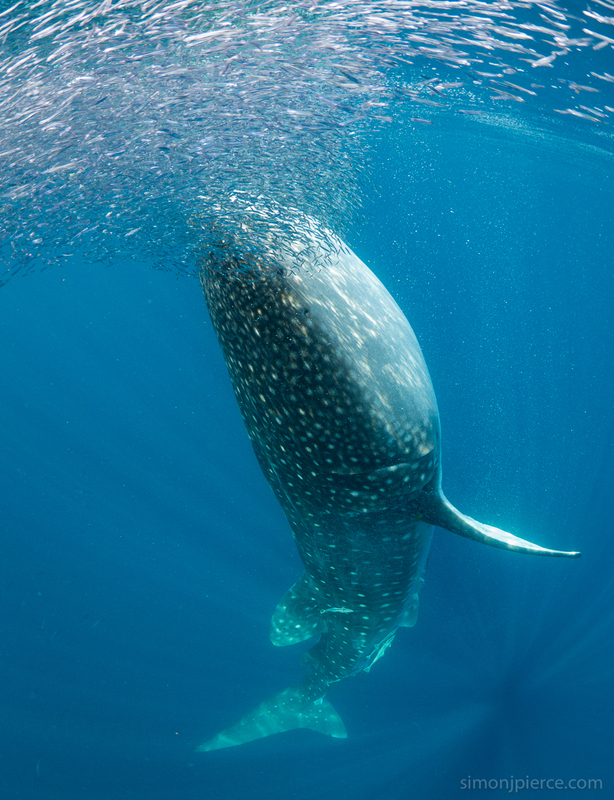 For more on the whale sharks of Mafia Island, head to the Marine Megafauna Foundation website.